When it comes to UTVs, sometimes a smaller vehicle is the perfect fit. For the perfect example, let’s take a closer look at the impressive R-150. Do you have a large property that requires a lot of maintenance, do you wish you could get from the house to the barn faster, do you need a vehicle that’s both comfortable and capable of helping you haul lumber or containers? The R-150 is all of that and more. It’s the perfect convenience vehicle because it’s easy to drive, lightweight yet sturdy, and has a towing capacity of 500lbs. 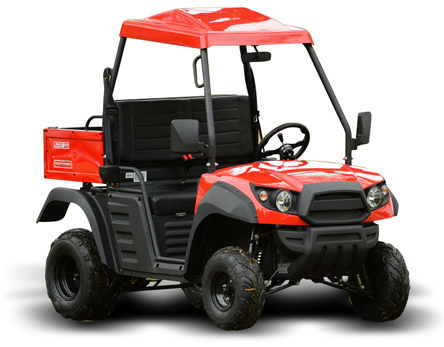 It might be the smallest UTV we offer, but that by no means makes it weak. For carrying items that don’t require towing, it offers a 250lb manual dump bed. So, the next time you have some yard work, hauling, or a construction job turn to the trusted R-150. Do you and your friends or family like to visit the lake? Perhaps you have a lake house or frequent a rental near a large open area? If so, increase your fun the next time you go by bringing an R-150 along for the ride. This two-wheeled drive vehicle might not be great for rough terrain, but it can certainly hold its own during a fun weekend of exploring. Because of its comfortable seats, digital speedometer, and auxiliary input outlet it’s perfect for a day of cruising around. Since it’s equipped with headlights, taillights, and turn signals you could even ride it into town to grab a burger or do some shopping. If you’re looking for a fun, light-duty UTV that’s affordable, useful, and exciting, then the R-150 is the perfect fit for you. To learn more about UTVs, please contact us today.